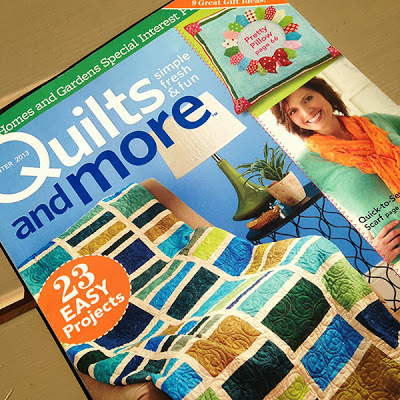 Guess what Quilts and More dropped off at my Market booth? I’m excited to have two projects in this issue – it will be popping up on newsstands in about a week. The first project is my Holiday Bouquet Sampler done in my line from Blend Fabrics by the same name. It looks hard but it isn’t. I just used my ornament print and outlined each ornament and stippled in between. 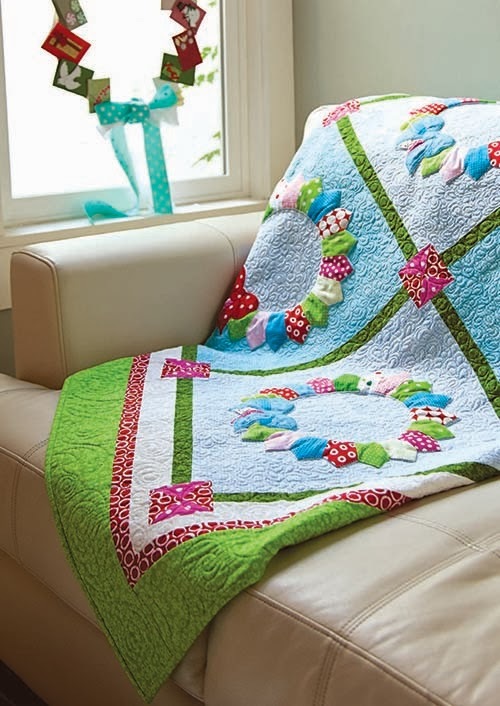 There is a little bit of applique in the center with small yo-yo berries. The cream print in the applique background can be challenging to find at this point but you can substitute any cream print. (I get multiple emails a day about that print and wish there was more. I don’t see sales reports that show which shops buy which line so your best bet if you are looking for which shop might carry the line in your area is to call the number listed on Blend’s site.) Many of the SKUs for this line are sold out but you can still find bolts in shops. 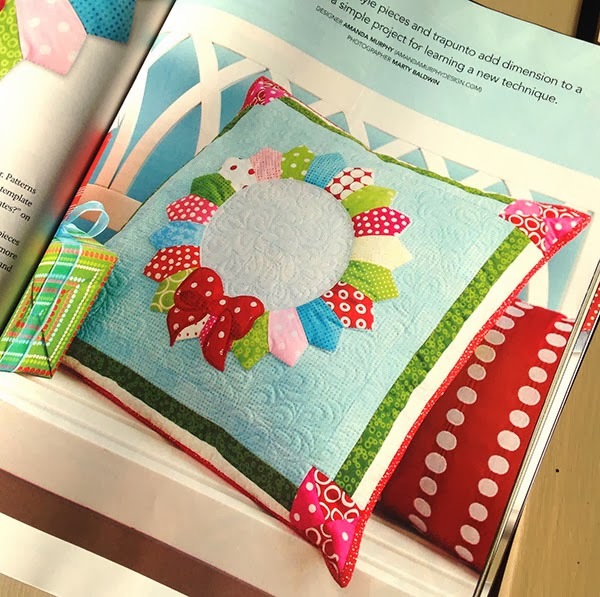 The second project is a Holiday Wreaths pillow. It coordinates with my Holiday Wreaths quilt in Modern Holiday. And thanks so much to all of you who voted for me in Craftsy’s Blogger Awards. 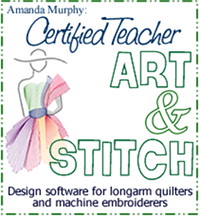 I won runner-up in the Embroidery category and am thrilled. Made my week! I hope everyone is having a great week and gets to fit in at least a bit of quilting. Previous post: To Market, to Market..
Congratulations. 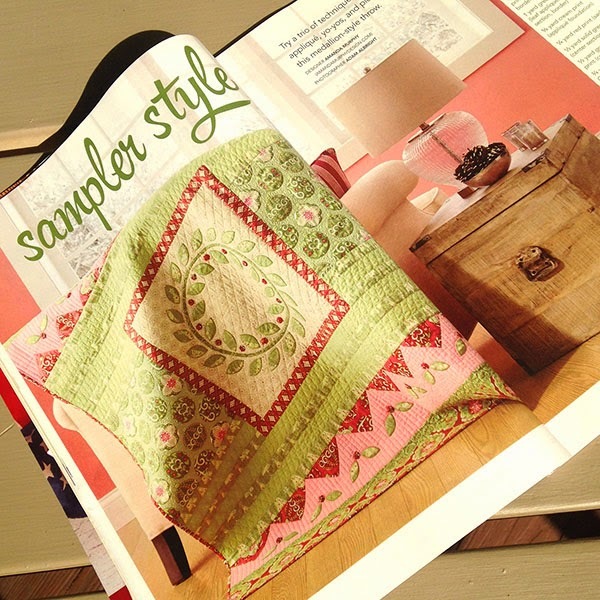 The quilts in the magazine are beautiful and the Craftsy award is well deserved. Congratulations! Your projects are wonderful and very festive! I am so happy! I've been checking every time I go into a store for this issue. Congrats!